Something to make you smile. Go TA! “We will repeal this tax, we will dismantle the bureaucracy associated with it. “I am giving you the most definite commitment any politician can give that this tax will go. This is a pledge in blood this tax will go. We have a different name for global warming in America, we call it Communism. Another good name for it is Global Yawning! Can we have him here in America?,…or maybe I will just go there, I will bring skills. The election can’t come sooner. What about this from The Australian: ‘“You’ll be able to see the biggest polluters changing their conduct and behaviour,” Ms Gillard told ABC [propaganda] Radio.’ Yeah, right, Julia. Pure delusion. 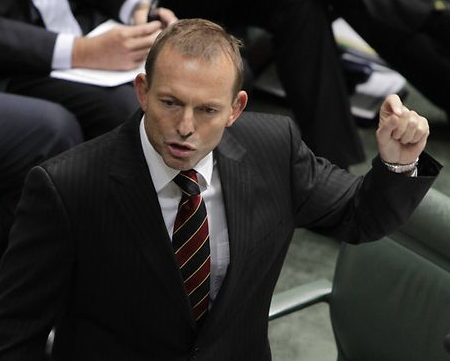 Come on, Tony – surely there’s a way you can do it? There has to be! Good on you Tony Abbott ! Forget blaming the Greens. Its LABOR, LABOR, LABOR. Labor has made this country a global laughing stock by enacting this mad, no-gain but economy damaging and disadvantaging global warming hoax abatement legislation. Don’t anyone forget that when they vote. trust me you can have him – he’s a lunatic! Sure, the carbon ‘dioxide’ tax and subsequent ETS may pass both houses of Parliament and be enshrined in law before 1 July 2012 … but just who will be stupid enough to invest anything in it; time, money, resources when there is a pledge, from our next Prime Minister written in blood, to dismantle it? We still have 7 months before July 2012 … and 7 months is a long time in politics! Inspiring from Tony. I am so glad we’ve got him standing between us and this horrendous tax. So the choice is between a carbon tax or Tony Abbott? The futility of it all would be almost funny if it wasn’t our problem. I like that to Ross, very funny. will not create jobs,will not raise or lower the sea levels. When Tony Abbott brings the Carbon Tax to a end, all that will be needed is to continiue the “compensation for one more payment, then cancell it altogether. After all, if there isn’t any tax, there is no need for any compensation. Hopefully, by that time there won’t have been any closures of Aussier companies or any loss of jobs by our people. But those who need compensation will have to continue to receive it. Good on ya Tony. We can only hope this disgraceful and incompetent bunch of liars currently calling themselves the government lose office as soon as possible. The Carbon Tax doesn’t kick in until July 2012. A lot can happen before then. Craig Thompson is likely to be charge well before, and even though the trial may be delayed, the stink attaching to the government will be untenable. I doubt however that all of the other criminal members of parliament will be able to stand the strain. It only takes one. Never, never forget the scientists and pollies, the bureaucrats, the ‘do-gooders’, the folk from the Ministry-of-we-know-best, all of whom hoisted their petards on misinformation and a wider UN driven social agenda that have scammed the world like never before. They are very likely to be the same duped folk that in times passed plaintively said that they were following orders. If Tony does what Julia has infamously done (says one thing / does another) I predict that the moment may become a pivotal in the devolution of Western democracy. Climate change is a risk management task. What if the science is right?